The robust construction, large surface area, and tilting keyboard tray are great, but you’ll miss the easy precision a motor can offer. 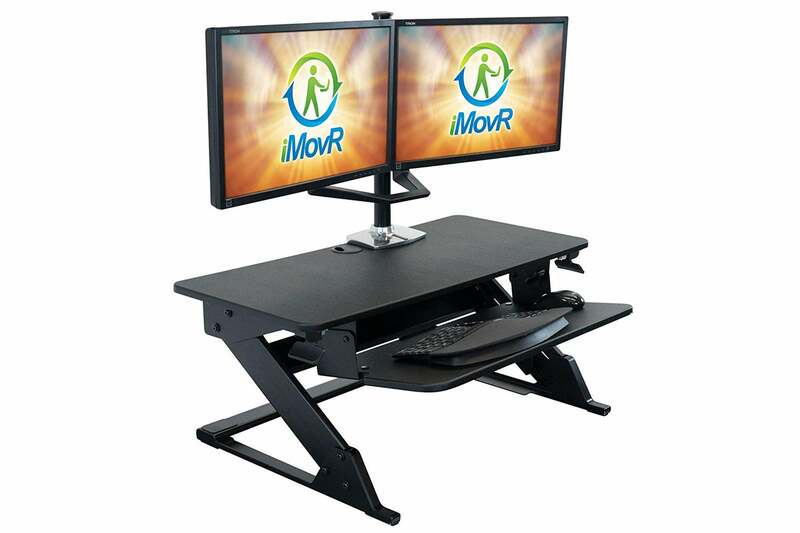 My first impression on taking delivery of the iMovR ZipLift Patriot standing desk converter was “Yay! I don’t have to put it together!” Assembling the Evodesk XE Pro desk that I reviewed early this year was a genuine pain in the neck. But after living with the Patriot for several weeks, I’ve concluded that it’s no better—or worse—than the Evodesk, it’s just different. The biggest difference, and I consider it to be in favor of the Evodesk, is that the Patriot operates on a mechanical lift where the Evodesk has a motorized lift. The Evodesk’s motor not only makes it easy to position the desk at a precise height, it also enables the desk to reach a lower position on your existing desk. That’s important, because you can’t adjust the height of that surface. But let’s swing back to some of the features that render the Patriot more attractive. First, iMovR’s desk is wider (35.5 inches vs. 27 inches). The desk material is also thicker, and it's covered with a surface that's much more tactilely pleasant. The Patriot also comes with a keyboard tray that’s deeper (13 inches compared to 9 inches) and that can be tilted to accommodate your needs. The Patriot’s keyboard tray is about a half-inch narrower than the Evodesk’s, however, which leaves even less room to operate a mouse on either side of a full-sized keyboard with a numeric keypad. 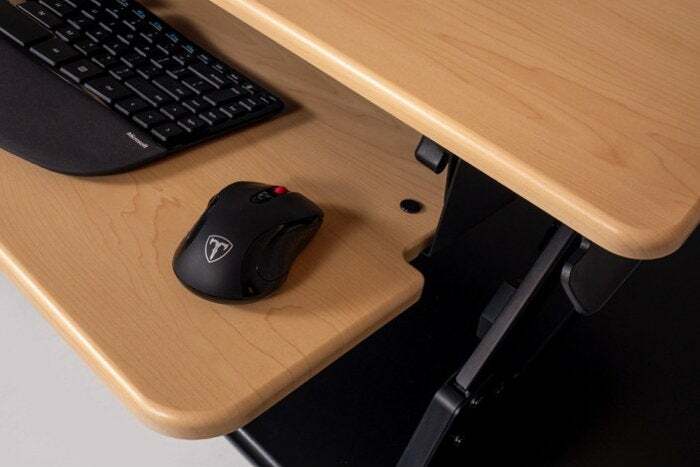 A slide-out mouse tray would be a welcome addition here, as I found it would be with the Evodesk. It's worth noting that the keyboard in this shot doesn't have a numeric keypad. The keyboard tray doesn't have a lot of room for a mouse. When you compare the price tags of the two desks, it’s important to compare apples to apples. The Evodesk XE Pro costs $428, and there’s a pillar in the back that can accommodate up to a 30-inch display. It will cost you an additional $149 to $169 to connect a single display to iMovR’s product, which costs $429 on its own. iMovR provided a support for this review that would accommodate a 30-inch display. Since it’s an add-on device, that did add an installation step to the process, and the experience of mounting my old and heavy 30-inch monitor to the Patriot was no easier than it was with the Evodesk. To adjust the Patriot’s height, which you’ll ideally want to do several times a day, you'll squeeze levers on either side of the desk and lift slightly toward your body to raise it. To lower it, you'll push down and slightly away from your body. I found it much easier to lower the desk than to raise it, but it often took several tries in either direction to get the work surface to the desired height. This wasn’t a difficult task, but it was tedious. I found the desk to be very stable even when raised to its maximum height of 20 inches (if you’re very tall, the Evodesk goes slightly higher, to 22 inches). The ZipLift Patriot can accommodate up to 35 pounds (plus 5 pounds on the keyboard tray), but if you need a monitor support, you'll need to purchase one separately. I like the iMovR ZipLift Patriot for its heavy-duty construction, the thickness and the smooth texture of its work surfaces, and its adjustable keyboard tray. It can’t accommodate as much weight as the Evodesk can, but 35 pounds is plenty for a 30-inch monitor and a laptop or a large all-in-one computer. 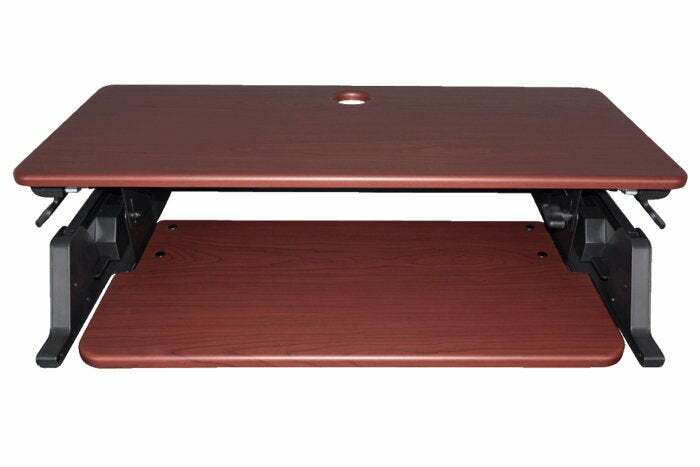 Aside from the positive features I’ve pointed out here, three factors will sway most people’s opinion to or away from this sit/stand desk: A price tag that’s higher than the Evodesk when you factor in the monitor support, the mechanical lift compared to the Evodesk’s motorized one, and the fact that you don't need to assemble it before you can use it. The iMovR ZipLift Patriot is a very good sit/stand desk, but you’ll pay more for fewer features if you need to mount a display to it.